Может ли кто-то комментировать такие? Я благодарна автору за определения сказочных условий, которые он использует! Royal piece: The side having this piece is in check if it is threatened (a King is a royal piece). Rose Lion: As a Lion, but on Rose-lines only. Lion(Li): Moves along Q-lines over another unit of either color to any square beyond that unit. A capture may be made on arrival, but the hurdle is not affected. Bishop Eagle – moves like a Eagle but on Bishop-lines only. Eagle – Moves like a Grasshopper, but deflects 90° either way on passing over the hurdle. The arrival square is adjacent to the hurdle. 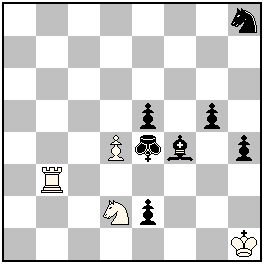 Pressburger King = White(Black)Super-transmuting King = King, which definitively takes the nature of the checking piece. 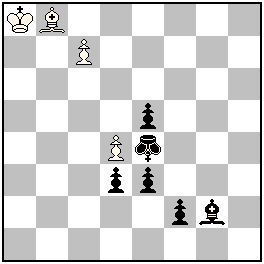 After being checking, the King loses his Royal status and can be captured. (Black) Transmuted King = King which, when in check, takes the power(s)f the checking unit(s) instead of its own. When not in check, such a King moves normally. Circe Double Agents: a unit (not King) when captured returns to opposite game array square with opposite color as part of the capturing move. Circe Turncoats: a unit (not King) when captured returns to its game array square with opposite color as part of the capturing move. 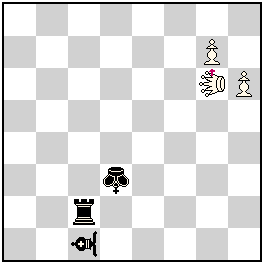 Reversal Einstein Chess = all units (Kings excluded) change their type when they move, according to a precise pattern. For captures moves: Q>R, R>B, B>S, S>P, P remains P. For non-captures moves: R>Q, B>R, S>B Q, P>S, Q remains. b) 1… Ke4 2.rRNh4 Rc4 3.g8=BE + Ke6=BE#. 105, 106 ….. Perhaps a record of 4 diff. Fairy conditions in the same problem !! Intimidating !